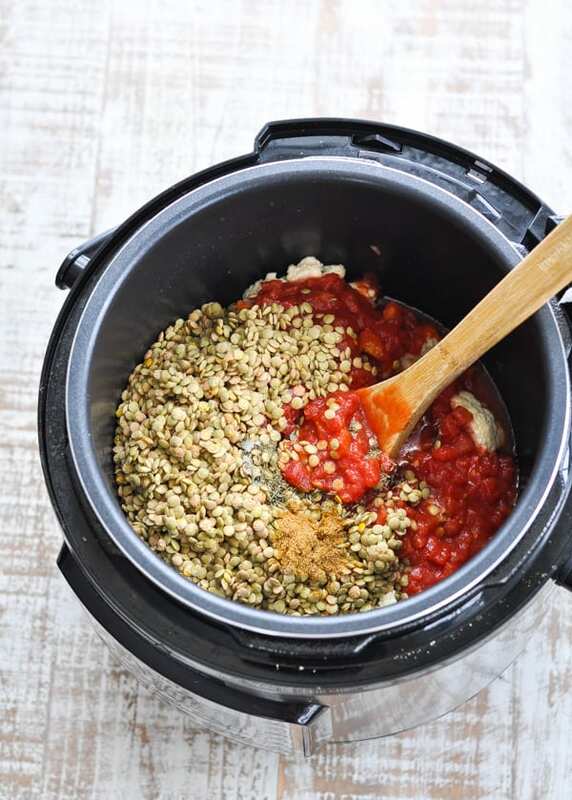 This healthy and easy Lentil Soup recipe can be prepared in the slow cooker, in the Instant Pot, or on the stovetop for a simple make-ahead meal! A healthy and easy dinner that warms and satisfies your body! 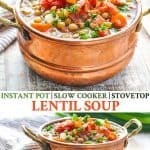 This Lentil Soup recipe can be prepared in the slow cooker, in the Instant Pot, or on the stovetop for a simple make-ahead meal that reheats beautifully throughout the week. If I’m going to treat my body to a bounty of nutrient-dense vegetables and lean, plant-based protein, then you bet I’m going to garnish it with at least a small amount of flavorful, soul-satisfying bacon. 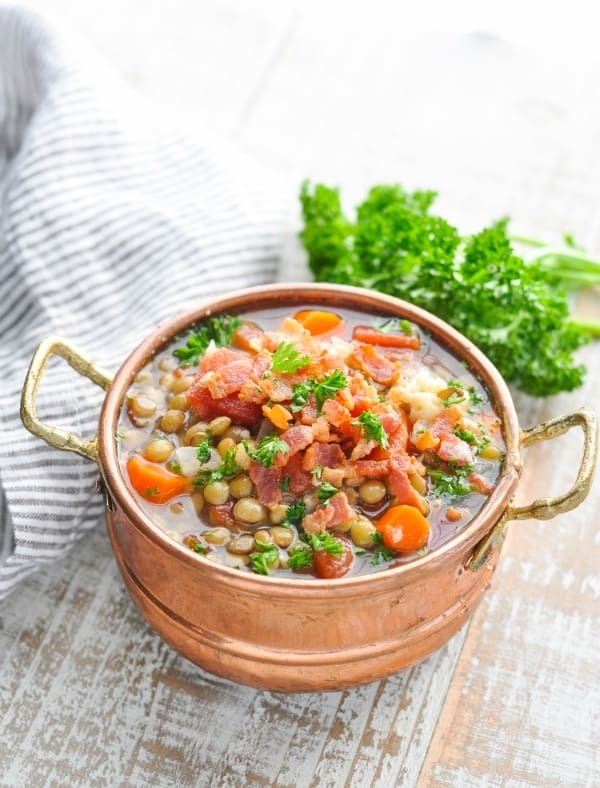 There’s definitely room for bacon on top of my Lentil Soup! That said, if you’re a vegetarian (or if bacon is just not your “thing” — GASP! ), then you can certainly leave it out of the recipe. I love the flavor that it adds to the dish (as well as the texture on top), but it’s definitely not necessary. 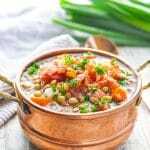 While this hearty Lentil Soup recipe obviously offers plenty of health benefits, you will appreciate the ease and convenience of this recipe the most. I’m going to show you the Instant Pot method in these photos, but I’ve also included instructions for the Crock Pot and stovetop as well. First, sauté bacon until crispy (about 5 minutes). Remove bacon with a slotted spoon, leaving the bacon drippings in the pot. Set aside the bacon to use for a crispy topping on your soup later! Sauté the carrots, celery, onion and garlic in the bacon drippings, just until the onions are soft and translucent (about 3-5 minutes). Add the rest of the ingredients to the pot — including the lentils, tomatoes, cauliflower and seasoning. What spices to put in Lentil Soup? I keep the seasoning simple by using just a few simple spices: garlic, cumin, thyme, salt and pepper. But feel free to get creative and add extra seasonings that you really love! No, you don’t! Just rinse the lentils and drain them before adding them to your pot. 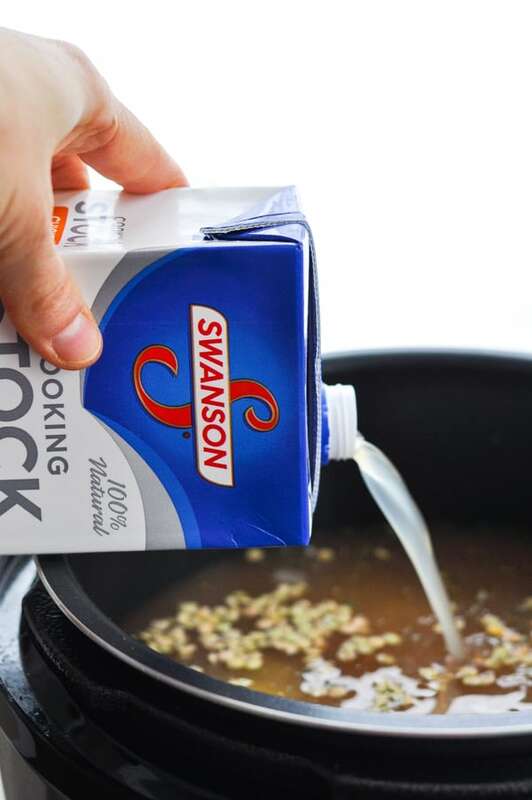 Pour chicken stock into the pot, seal the lid, and cook on “high” pressure for 6 minutes. Remember that the Instant Pot my take up to 25 minutes to come to pressure before it starts the 6-minute timer. Can you freeze this Lentil Soup recipe? Yes! This soup freezes very well. Just allow the soup to cool to room temperature, pack in an airtight container, and store in the freezer for up to 3 months. To reheat the soup, thaw in the refrigerator overnight. 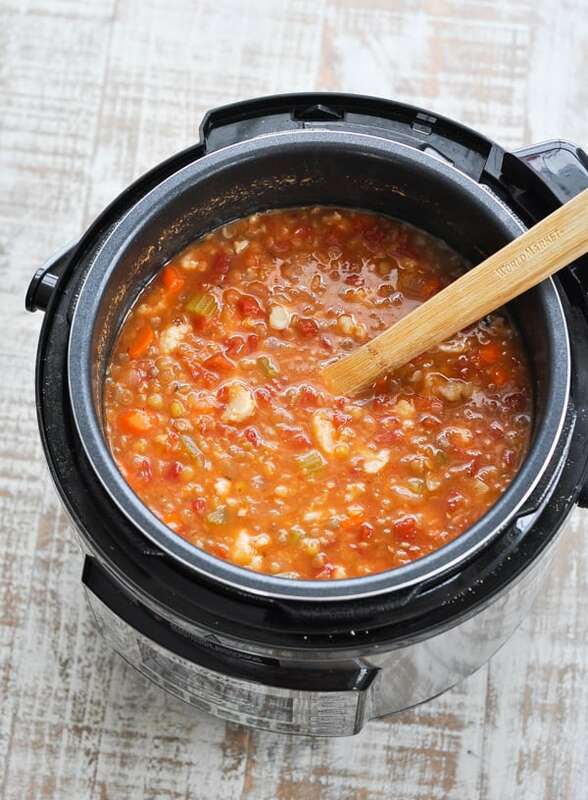 Warm the soup in a pot over low heat on the stovetop, just until it reaches the desired temperature. How do you make vegetarian lentil soup? 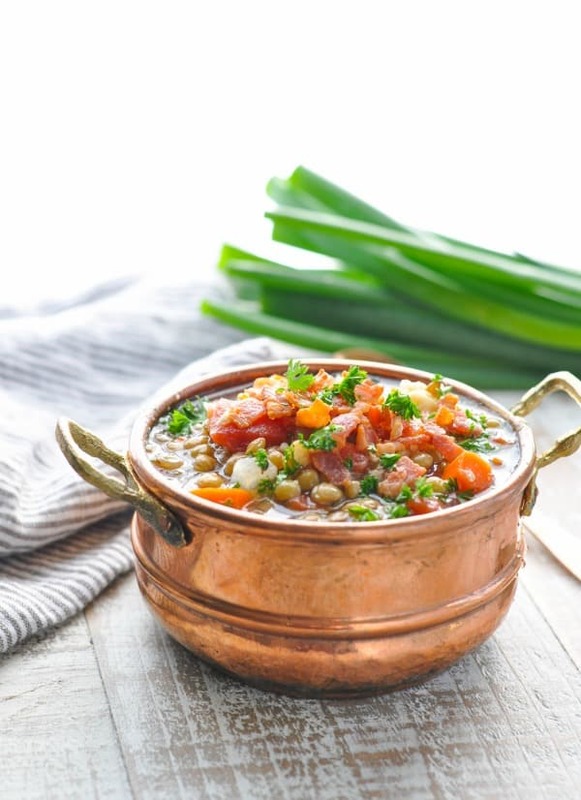 You can make this lentil soup recipe vegan with a couple of simple tweaks. Omit the bacon and instead sauté the vegetables in 1 tablespoon of olive oil if preparing the soup in the Instant Pot or on the stovetop. Instead of the chicken stock, use vegetable broth (or vegetable stock). Make ahead! The soup thickens significantly as it sits in the refrigerator, so whenever possible, I like to prepare a batch at least 1 day in advance. Then I can just reheat the soup when I need an easy lunch or dinner. I like the texture of brown or green lentils best because they’re “sturdier” and don’t break down as easily during the cooking process. 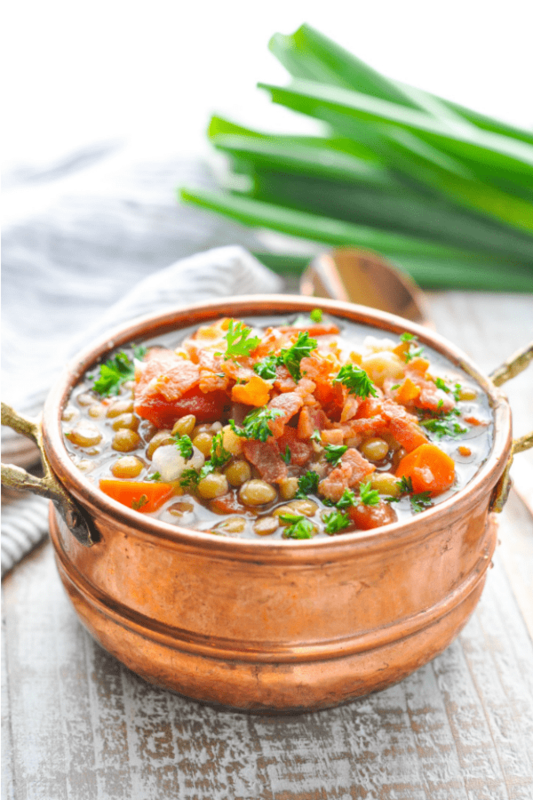 If you prefer a smoother soup with the lentils completely broken down, try a red lentil soup recipe by swapping out the green lentils for red lentils! For a creamier texture, use a handheld stick blender or a regular blender to puree some of the soup at the end of cooking. In a large skillet, cook bacon over medium heat until crisp. Remove with a slotted spoon and set aside to use as a garnish on top of the soup later. 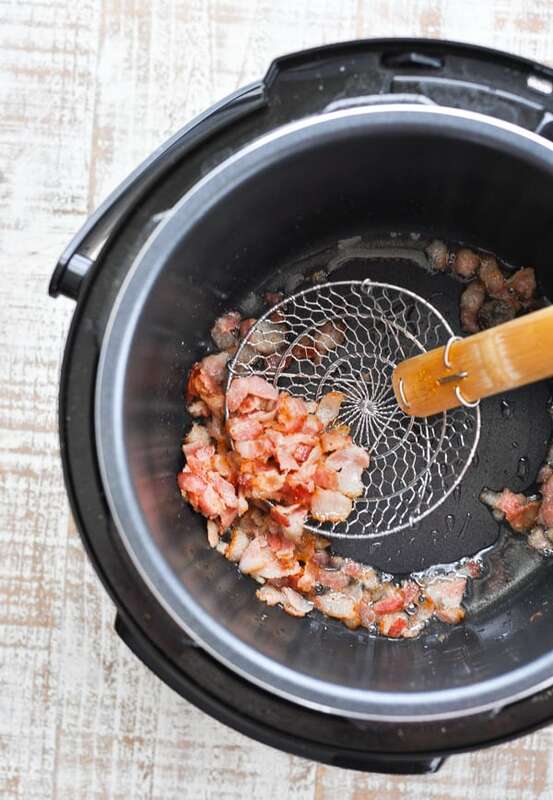 Place 1 tablespoon of the bacon drippings in the bottom of a 6-quart slow cooker (discard any remaining drippings). 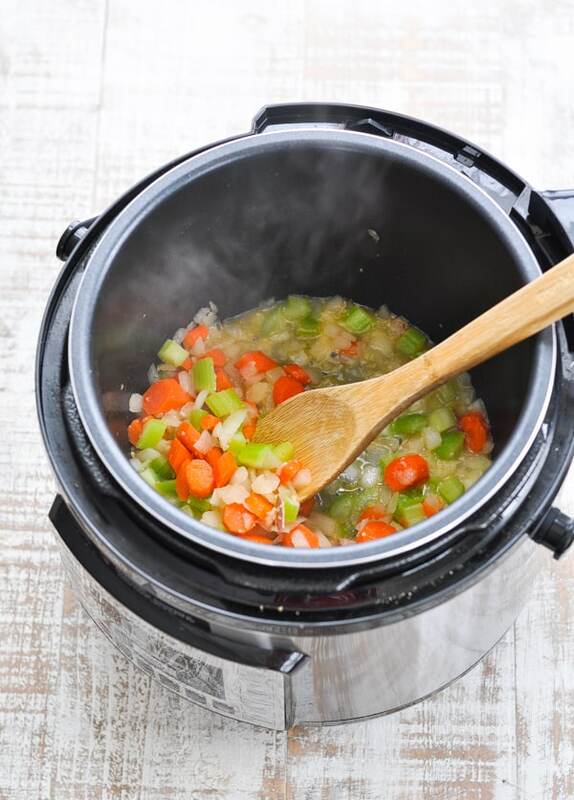 Add lentils, onion, carrots, celery, cauliflower, and garlic to the slow cooker. Stir to coat with bacon drippings. Add chicken stock, diced tomatoes, cumin, thyme, salt and pepper. Stir, cover, and cook until lentils and vegetables are tender (on LOW for about 8 hours or on HIGH for about 4 hours). Serve in individual bowls and garnish with crispy bacon. In a large soup pot, cook bacon over medium heat until crisp. Remove with a slotted spoon and set aside to use as a garnish on top of the soup later. Leave bacon drippings in the pot. Add carrots, celery, onion, and cauliflower to the pot. Cook and stir over medium heat for 6-8 minutes, or until tender. Add garlic, cumin, thyme, salt and pepper and cook for 1 more minute. Stir in lentils, chicken stock, and diced tomatoes. Bring to a boil. Reduce heat; simmer, covered, for 30-35 minutes (or until lentils and vegetables are tender). Serve in individual bowls and top with crispy bacon. Turn the Instant Pot to “Sauté” function. When the pot is hot, add bacon and cook until just crispy (about 5 minutes). Remove bacon with a slotted spoon and set aside to use as a garnish on top of the soup later. Add onion, carrots, celery, and garlic to the pot with the bacon drippings. Sauté just until the onion is translucent (about 3-5 minutes). Turn off the pot. Add lentils, cauliflower, chicken stock, diced tomatoes (in the juices), cumin, thyme, salt and pepper. Secure the lid on the pot. Close the pressure-release valve. Select “manual” and set the pot at “high” pressure for 6 minutes. It may take the pot up to 25 minutes to come to pressure and start cooking. At the end of the cooking time, allow the pot to sit undisturbed for 10 minutes, then release any remaining pressure. I like the texture of brown or green lentils best because they're "sturdier" and don't break down as easily during the cooking process. If you prefer a smoother soup with the lentils completely broken down, try a red lentil soup recipe by swapping out the green lentils for red lentils! This post was originally published in January, 2018. It was updated in January, 2019. That looks like such a warm and cozy meal, Blair! I agree that we don’t need to change the calendar to set goals, but it is nice to feel like you can reset. And I would love to warm up with a big bowl of this for lunch. And yes to all of that bacon on top! Hope you had a wonderful holiday! Thank you, Gayle! It’s definitely a cozy meal! Hope you had a wonderful holiday, too. Happy New Year! 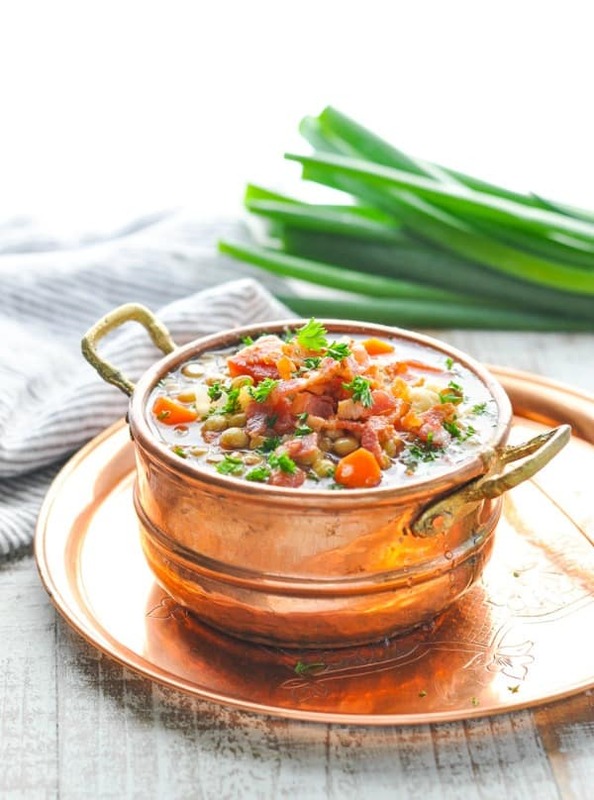 I would definitely have bacon on top of this soup too…looks delicious! Can you use red lentils in this recipe? Thank you. Thank you. I used green lentils and a hand blender to cream up the soup after cooking. I also added so e spinach. Made this soup tonight and it was really good, although it’s different from what I’m used to. It was nice to make a dish a little outside my palette comfort zone, since I’ve not made a vegetarian or Indian/Middle Eastern before. I used curry powder because I totally forgot to buy cumin but it was still yummy. Thanks for another great recipe. Great recipe. I live in Spain so I used pata negra offcuts instead of bacon and cooked them in the stew as they needed to be softened. We still have a lot in the freezer for another day.